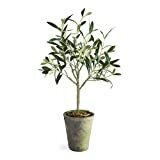 Olive tree growing tree of the genus Olea, Olive tree perennial evergreen plant also used as ornamental plant for the trunk, can grow in mediterranean, subtropical and temperate climate and growing in hardiness zone 8-11. Flower color yellow, the flowers of Olive grows in clusters. Fruit when it ripen is black-purple but can be picked when it’s green or black, Fruits can be eaten directly from the tree but they are bitter, better to consume the olives after process to be pickle or oil. What can be done with big quantities of Olive fruit?